THE St Vincent de Paul Society’s new chief executive officer in Queensland can’t wait to “get out into the field”. Kevin Mercer’s been appointed to the role to succeed Peter Maher who is retiring. They will work alongside each other in transition until March 1 when Mr Mercer takes over as chief executive officer. 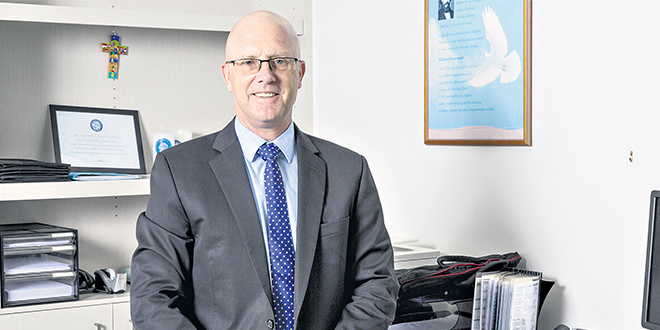 Mr Mercer, whose career in Catholic ministries began about 10 years ago when he was chief executive officer for Holy Spirit Care Services on Brisbane’s northside, said it was a privilege to be offered and to accept the leadership role at Vinnies. “It’s such a wonderful organisation (with) a great reputation,” he said. Mr Mercer admired “the trueness of Vinnies’ service delivery, and the way it’s so real in terms of their membership model, and the Vincentians and how they engage with the community at the grassroots, which I think is so important”. “You’ve really got to be close to your people and close to the communities to really understand the needs, and I think Vinnies do that so well,” he said. Mr Mercer said that, once he had become familiar with the organisation of the society, he was keen on “getting out into the field and meeting the people, the members and the Vincentians in the field who were doing the works, and really getting engaged in the diocesan areas and the regions within St Vincent de Paul and engaging with them and understanding their communities and their community needs”. In settling into his role, his first priority would be engaging with the stakeholders – “all the stakeholders”. “Collectively (the stakeholders are) the members but it’s also all our volunteers, it’s all the staff and the key people within the communities we serve,” Mr Mercer (pictured) said. Mr Mercer had brief engagement with Vinnies when he was working for Holy Spirit Care Services. At that time, the Holy Spirit Missionary Sisters were involved in providing short-term crisis accommodation for women and they worked with Vinnies in that field. Mr Mercer was impressed then by the professionalism of the Vinnies organisation. He was chief executive officer at Holy Spirit Care Services for seven years and then spent two-and-a-half years in Melbourne with Mercy Health, heading their aged care and community care services. Since returning from Melbourne last July, he has worked with Mercy Communities in Brisbane. Mr Mercer paid tribute to Mr Maher for the work he’d done as Vinnies chief executive officer for the past 15 years. “You can’t say enough about what Peter Maher’s done for Vinnies,” he said. “He’s transformed the society really and it has a very high professional standard. “He’s just spread and increased the number of people that we serve and assist over the years, and I feel I’m inheriting an organisation that’s in really, really good shape.